Teaching decimals can be tricky. 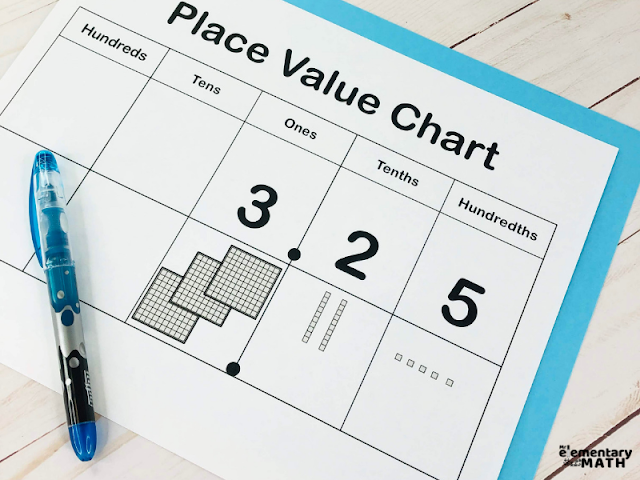 Even if students have a good grasp of our place value system, it takes time and exposure to get them comfortable with the shift from whole numbers. If they're shaky on how place value works, it's an even tougher task - like building a house with a weak foundation. 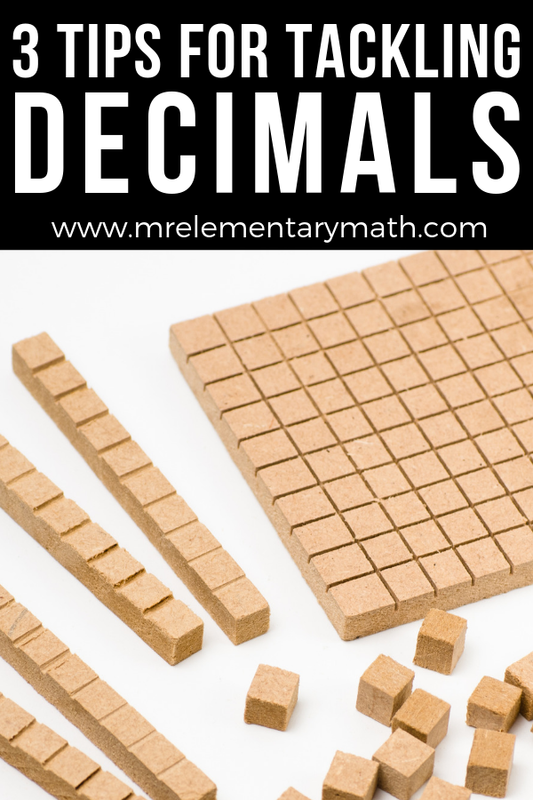 Since our kids are exposed to decimal understanding, comparing decimals to one another and understanding their connection to fractions, laying a good foundation and being consistent are key. Decimals are a fairly abstract concept, so making them more concrete and hooking them up to something they're already familiar with (fractions) is a no-brainer. Put yourself in their shoes- they recently started understanding that fractions can represent numbers less than one, but now they're learning there's another way to represent those same values and it looks very different. Yikes! 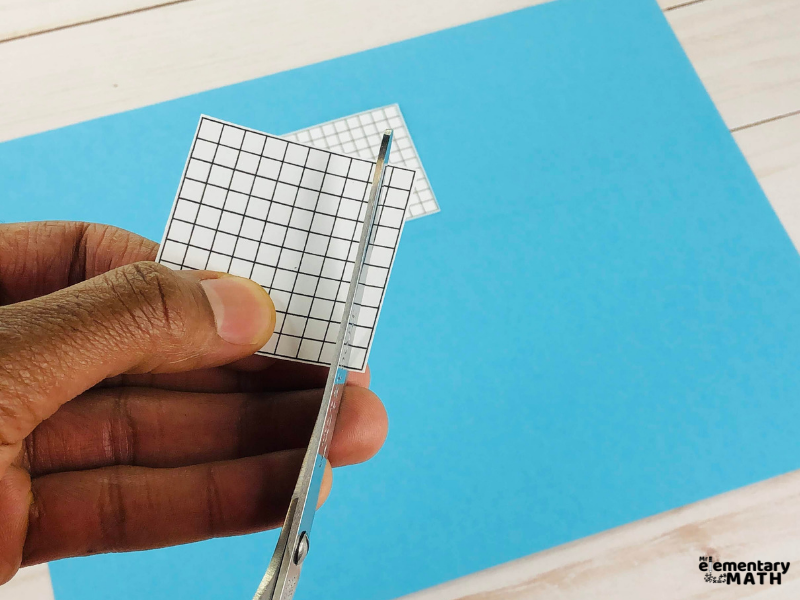 Clear the confusion and illustrate the fraction-decimal connection by representing a decimal number with a piece of graph paper or grid with 100 squares. Have students count all of the squares in the entire square. Then find a set of ten squares to cut and note what fraction is represented by that part (in relation to the whole square). They'll see that it's 10/100. Then have them cut out ten more parts or 10/100. Continue to cut out tenths until there are no more tenths available. Next, students can flip over each part they cut out and label it 1/10 or 0.1. Explain to your students that 0.1 is a decimal number and is read "one tenth." 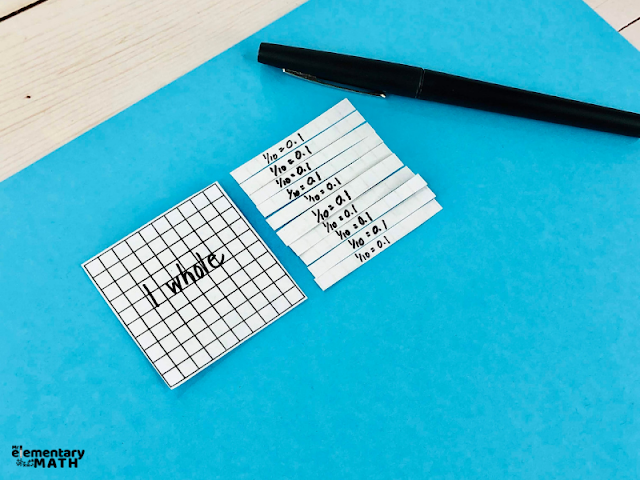 Each cut out portion represents one tenth or ten hundredths of the initial whole square. Finally, discuss that ten tenths is equal to one whole (students should easily see this with the cut out grid). Use a similar process by changing up the model (ie. circles or number lines). As they continue to count and relate what they're seeing with decimals, they'll begin to feel more confident. 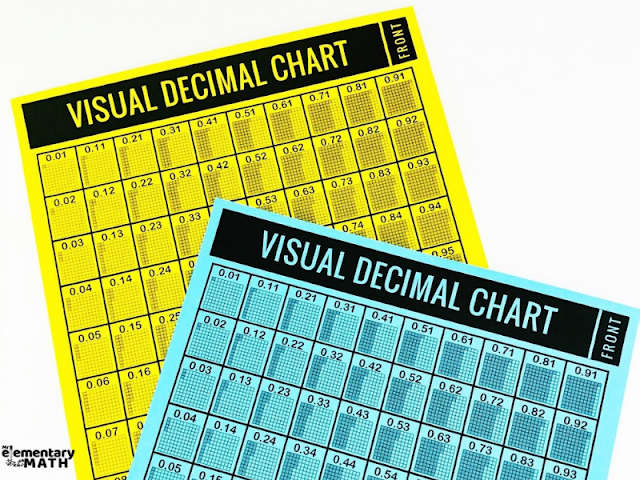 Working with students daily as they begin to read and write decimals is crucial, but you can sabotage some of that progress by using the wrong vocabulary. Time for a little self-training! While adults commonly read this number - 3.25 - as three-point-two-five, children starting out with decimals need to solidify the decimal connection to the place value system. That means incorporating place value when reading decimals, so the number should be read: three-and-twenty-five hundredths. Just like students used place-value charts to understand whole numbers, the same tool is critical to understanding and exploring decimals. For example, students can record 3.25 inside of a place-value chart by extending it to the right to show decimal places. They can easily see the connection between the digits in 3.25 and the value that each digit holds. As a piece of advice do regular warms that include a few sets of decimal numbers. Practice with your students as they read the decimals and write them down. 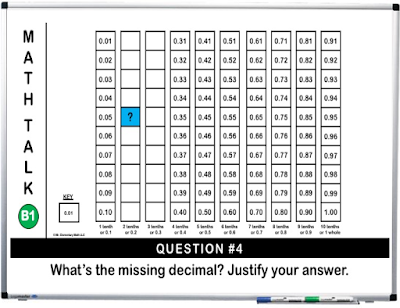 Like any other concept, decimals aren't just a new piece of information for kids to memorize and move on from. I'm sure the struggle is real when it comes to fraction mastery.... and decimals are no different. They're a big part of our number system and the gateway to more complex arithmetic. You've probably heard that people need to do something for 30 days to make it a habit. The same holds true for kids, too. To help your students master decimals, I've created a 30 day decimal warm - up routine. 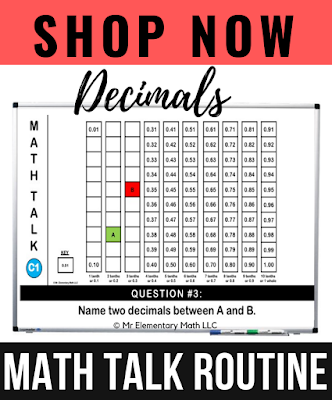 This routine engages your class in meaningful math discussions and builds decimal understanding within 1.00 (by the hundredths). Each day, project one math talk lesson onto your interactive whiteboard. 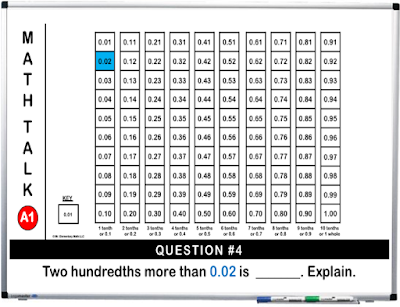 Students will complete a daily decimal count using a visual decimal chart plus answer 4 questions. Don't worry because the answers are included! With 3 levels and 10 math talk activities included in each level, you'll have access to 30 days of decimal learning. Take your student understanding to the next level by using this routine with your class. Click on the image below to purchase. Let's face it - decimals aren't a walk in the park. If you go out to dinner with your friends and have to split a bill with decimal numbers, you'll probably get some panicked looks (from grown adults) before the phone calculator comes out. 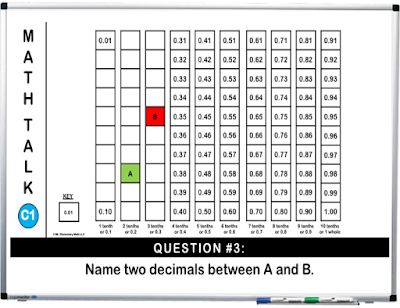 But with the right tools, you and your students can rise to the decimal challenge. I hope the tips I've shared will be a helpful addition to your math toolkit. P.S. Want to discover more math goodness? 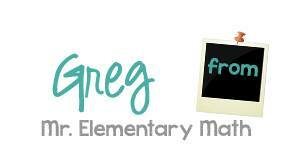 Head on over to Mr Elementary Math blog to learn more.